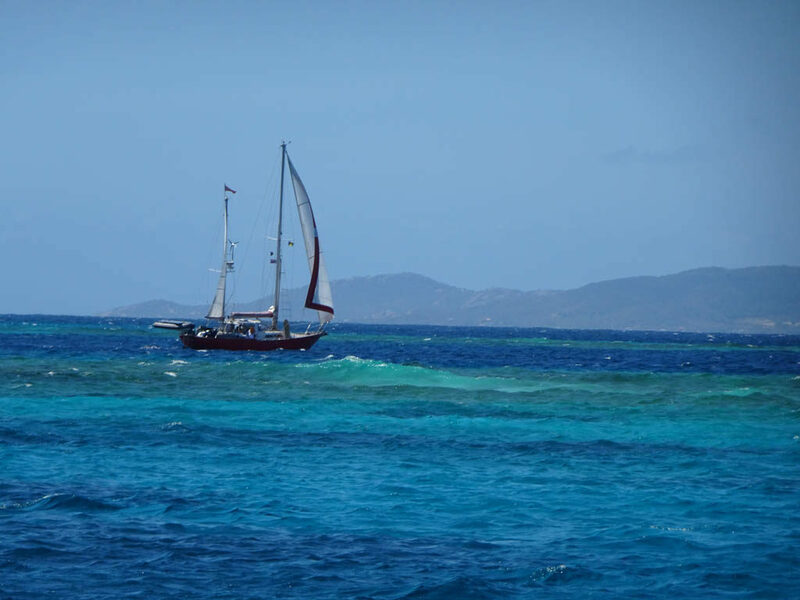 We left Bequia on March 6 and sailed to Tobago Cays further south in the Grenadines. The Tobago Cays consist of five small, uninhabited islands and several shallow fringing reefs and a large barrier reef to the east known as Horseshoe Reef. 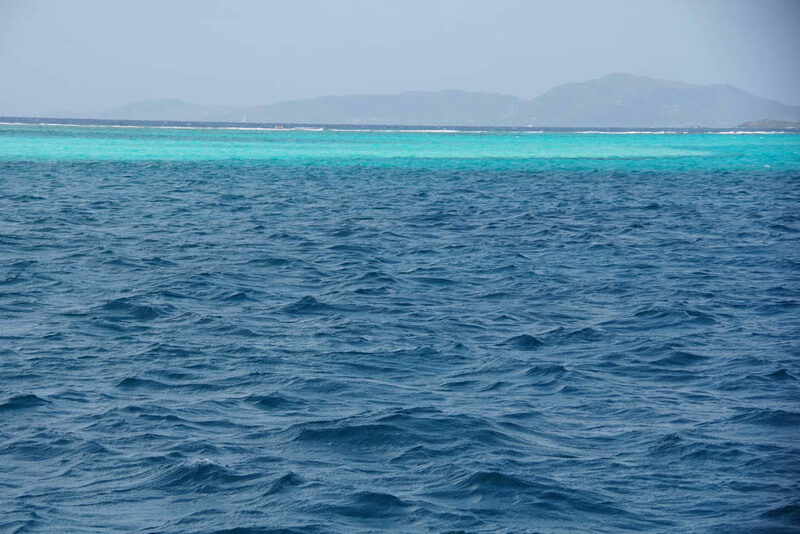 Behind the reef is a lagoon with a sand bottom where we anchored. The whole area is a marine national park. It blew hard every day we were anchored at the Tobago Cays as it has almost every day since we arrived in the Caribbean, So hard on some days that we could not swim or snorkel. Nonetheless, it is a magical place. At low tide on more moderate days we took the dinghy up to the reef to snorkel. The reef was still vibrant and there were plenty of fish, including a Caribbean blue shark that surprised us. Turtles swam around the boat constantly. 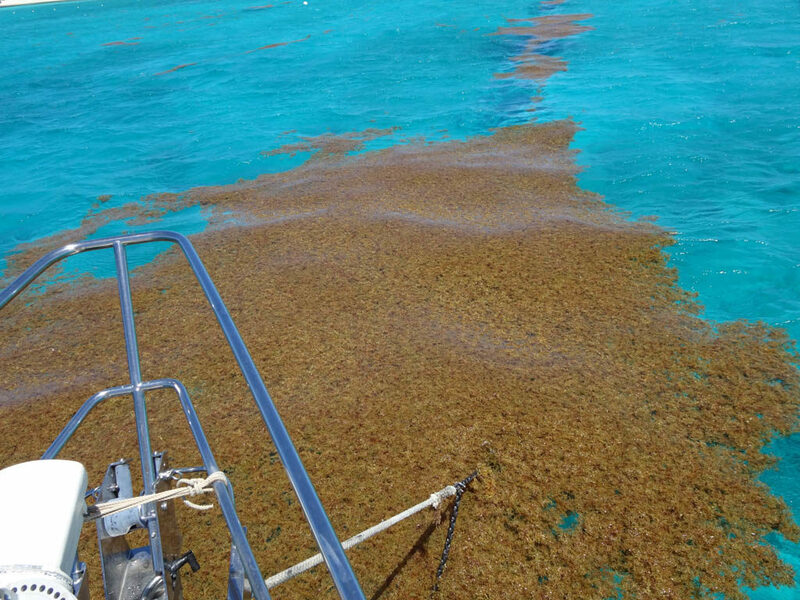 On a day when the tide was high and the wind was strong, sargasso weed blew over the reef and into the lagoon. This is a view of the anchor chain and snubber of Sabbatical III. Boats at anchor in Cumberland Bay, St. Vincent Island. Sabbatical III at far right. 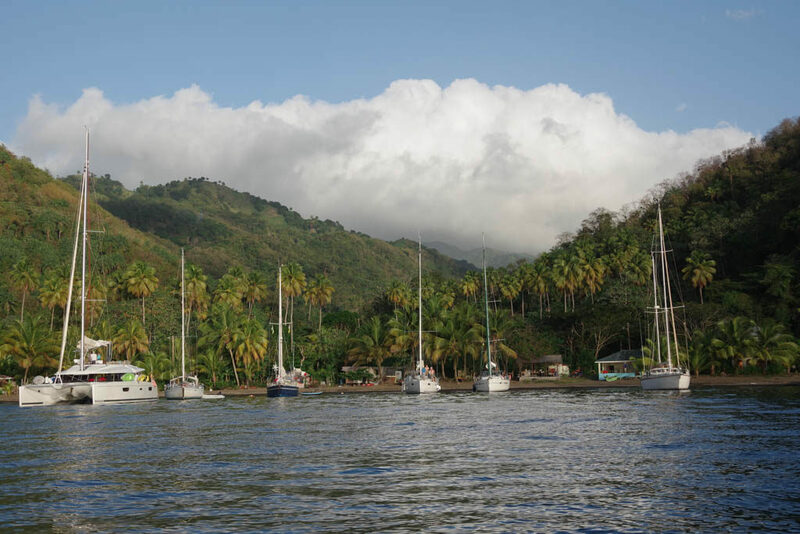 We left Bequia (for the second time) on March 20 and sailed up the west coast of the high, mountainous island of St. Vincent as far as Cumberland Bay. We have sailed past St. Vincent Island many times, marveling at it’s beauty, but never stopped because of it’s longstanding reputation for petty crime against boats. 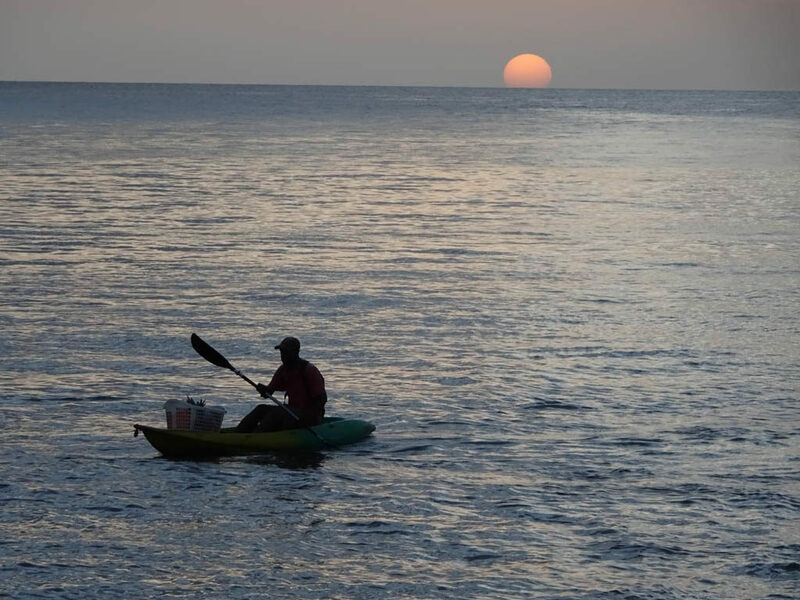 Our friends Melinda and Dave of “Sassoon” spent a few days at Cumberland Bay on their way north from Bequia (at the same time that we went south to Tobago Cays) and sent us a glowing report of the beauty, friendliness and safety of the place. They certainly did not exaggerate. We arrived at midday on a Wednesday that was, unbeknownst to us, “party night” at Cumberland. Large (60 foot) crewed catamarans come in late Wednesday afternoon and discharged their passengers for BBQ and steel drums ashore. There were 3 boats when we arrived at noon on Wednesday but there were 14 boats anchored by sunset. The water in Cumberland Bay is too deep to safely rely on a single anchor to hold a boat in the prevailing easterlies that blow down from the mountains. 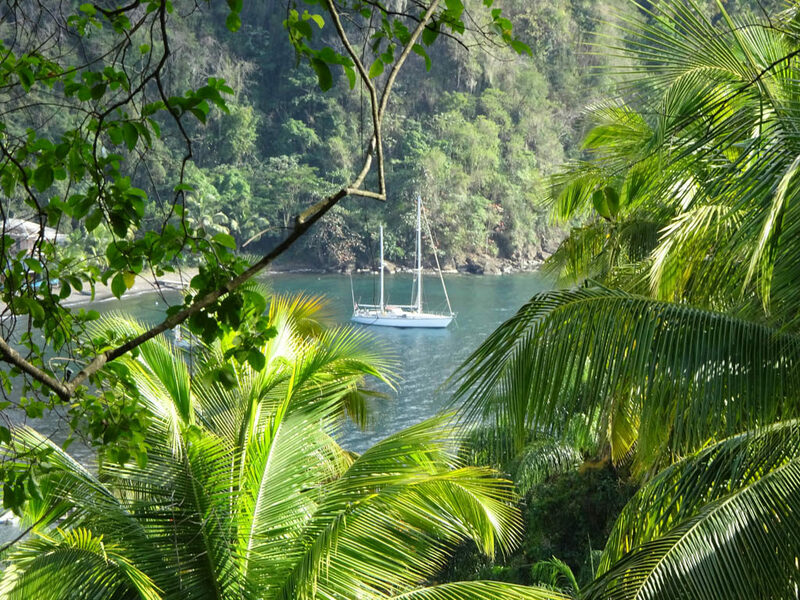 The system is to drop an anchor in the deep water and then take a line ashore from the stern to a coconut palm or other object. The weight of the boat is taken by the stern line. The anchor mostly keeps the bow into the swell and any light westerlies that might arise in the afternoon. There are “boat boys” who come out in a dinghy to take your stern line and bring it ashore for a different set of men to tie to the tree. 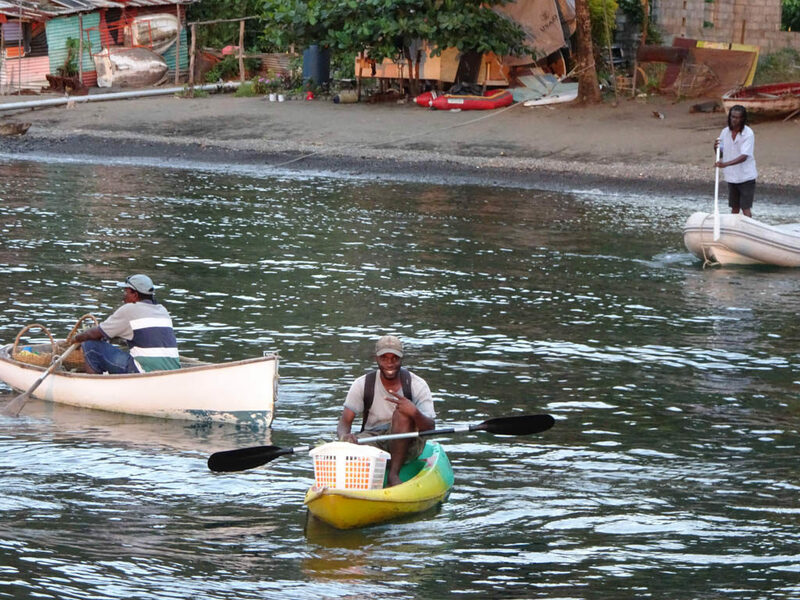 There are three of four “boat boys” who take turns handling arriving boats, even though only one would be enough to handle the traffic. The “boat boy” is tipped for his efforts and he shares some of that with the guy ashore who ties the knot around the tree. That way, more people in the community benefit from the boats that visit. Knowing the anchoring setup, we had a strong 140 foot line prepared, our longest line. But even that was not long enough. We added two shorter lines to the end of the long line to make a bridle to each stern cleat. We did not join in the Wednesday night party ashore. We were content to listen to the steel drum band from the deck of Sabbatical III. We had snorkeled on the reef at the entrance to the bay earlier in the day and were tired from our long day. The next morning almost all of the boats departed leaving only 3 other boats at anchor. We went to the Mojito Restaurant ashore and arranged for one of the members of a large, extended family to drive us to Dark Falls, a set of waterfalls about an hour drive away. It seems that everyone in the small community of Cumberland is related. Our driver (Jamaal) brought his cousin (Mata) along. The cousin is one of 27 children born to the partners of his father. The four small restaurants ashore are all owned by different uncles, and they all know where you eat and even what you ordered. (One must order hours in advance since they acquire many of the ingredients after you order). Apparently, the most important industry in the hills above Cumberland Bay is ganja growing for export. This industry is somewhat in decline and tourism is a seen as a good alternative. The trip to Dark Falls was amazing and the driver and his cousin were extremely interesting and friendly. The narrow road is cut into the volcanic mountains rising steeply from the sea and is full of hairpin turns. The driver honks the horn before every hairpin turn so as to alert any car that may be coming the other way. Typically, there is not enough room for two cars to pass on a turn. The views were spectacular. Dark Falls is set in a forested highlands and one must traverse a pedestrian suspension bridge made from bamboo. Laura even had a swim under one of the waterfalls. We are now back in Le Marin, Martinique. 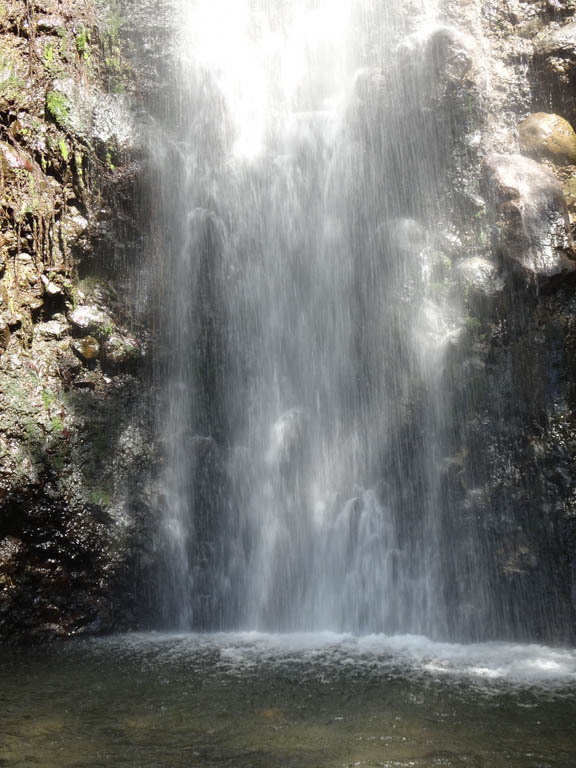 One of the waterfalls at Dark Falls, St. Vincent Island. 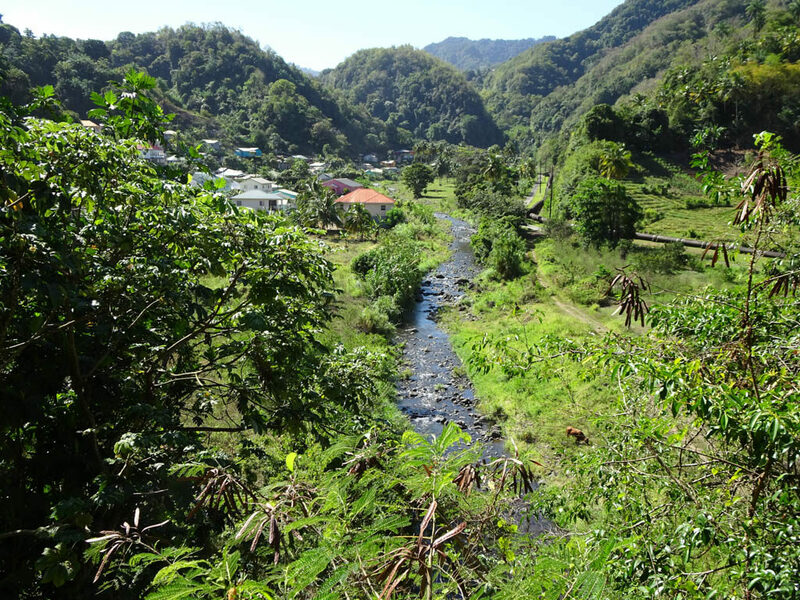 Village above Cumberland, St. Vincent Island. A dog bit me here when I tried to take a photo of the mural in the front of the house of a Rasta. Fortunately, St. Vincent is rabies free. 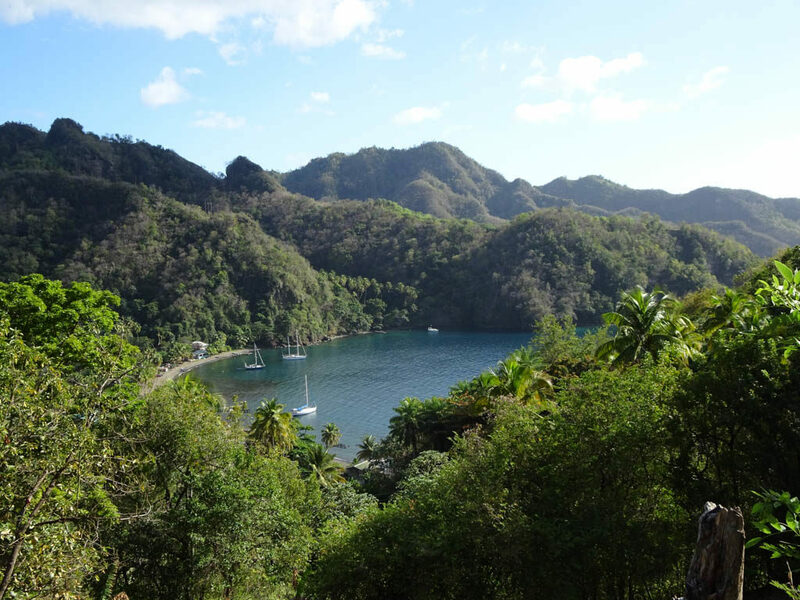 Cumberland Bay, St. Vincent Island. Our fruit seller “Gas” on his way to meet our fruit cravings. 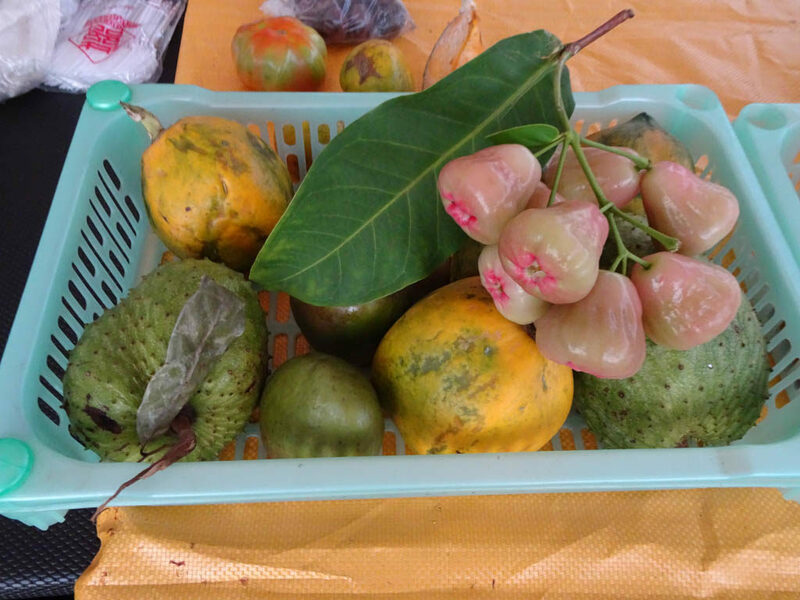 Fruits for sale. Cumberland, St. Vincent Island.